Two Point Hospital’s latest trailer spells out its core gameplay loop in greater detail, and previews more of its seemingly endless variety of whimsical diseases. As well as turtle head – which is obviously where your head shrinks into your neck – there is the terrifying scourge that is monobrow. If left untreated, patients’ monobrows can detach and wriggle around your hospital, infesting it like rats. Or, in this case, hairy worms. “Anything you can do, I can do better” was a conveniently empty boast until videogames came along and ruined it for everyone – step into someone else’s shoes with the best simulation games on PC. Speaking at the PC Gaming Show at E3 earlier today, the Two Point Hospital devs mentioned that they are targeting a release for some time in the autumn. 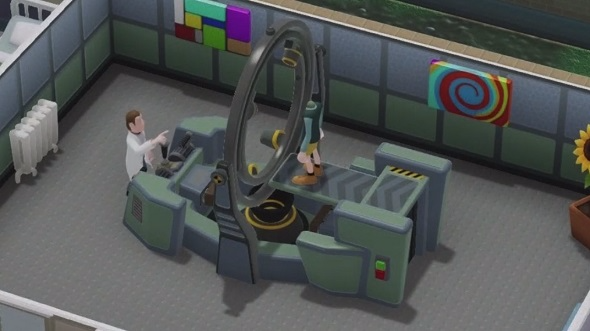 We got to take a look at the first level of the game a few weeks ago, and found it to be basically everything that old Theme Hospital fans are probably hoping for. Click here to check out our Two Point Hospital preview. One last, random thought: had you ever considered that, actually, Two Point Hospital’s diseases are horrific? We have. Here’s a short story about Two Point Hospital in real life. Don’t let it put you off though, or anything.